Disneyland Resort’s Downtown Disney District welcomes refurbishments and some new venues in 2018, including the first Orange County location for Ballast Point brewery. The San Diego-based brewery offers award-winning beers and an extensive menu of Southern California cuisine, including salads, small plates, flatbreads and entrees featuring local, sustainable and seasonal ingredients. 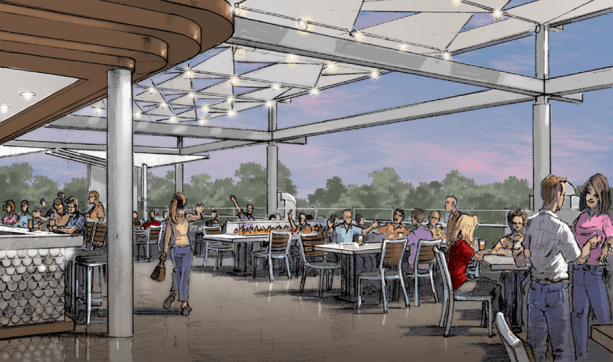 The new location will house Downtown Disney’s first-ever on-site brewery, tasting room, kitchen, and outdoor beer garden. In addition to serving Ballast Point’s iconic beers, such as the Sculpin IPA, the location also plans to serve exclusive, limited-edition beers available only at Downtown Disney. Construction on the new Ballast Point location begins soon across from Catal Restaurant and Uva Bar. World of Disney is reimagined into a dynamic, distinctly Disney retail environment. The flagship store remains open during the majority of the refurbishment, with work completed in phases throughout 2018. Splitsville Luxury Lanes offers unique dining, drinks, bowling, and entertainment. It opens on January 29. Naples Ristorante e Pizzeria expands its outside patio with a new outdoor bar. Inside, three wood-burning ovens are being installed. The restaurant remains open during construction, which should be complete by fall 2018. Black Tap Craft Burgers & Beer, opening later this year, offers award-winning burgers and signature CrazyShake milkshakes. 2018 will certainly be a busy year for Downtown Disney District, so keep an eye out for all these exciting changes. What is going through Disneys mind…. A brewery now.. Very family friendly. Bistros, arty farty food. What’s wrong with a burger place for a bite, why do we have to be treated to an influx of expensive lettuce leafs on a plate. Proper food please Disney…..
Quick reminder that Ballast Point’s parent company, Constellation Brands, is actively fighting (with violent police thugs) the city of Mexicali over the privatization of the city’s already diminishing water supply. Northern Mexico and the Southwestern US have been experiencing the longest drought in recent history and Constellation Brands is only making things worse in their greedy pursuit of profit. The people of Mexicali deserve better than this and I implore everyone to boycott Constellation Brands’ subsidiaries, Modelo, Corona, Pacifico, and in this specific case, Ballast Point.